I like to keep a package of fresh pasta and a package of sausage–turkey, chicken or pork are all good options–in my refrigerator for a quick, easy meal. 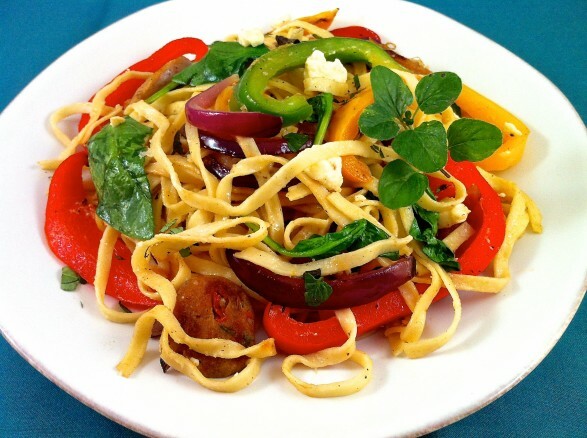 These two ingredients, paired with any number of vegetables, cheeses, and herbs can be the foundation for what is essentially a delicious pasta stir fry. Since the fresh pasta and sausage are vacuum-packed, they will keep for several weeks in the fridge and can also be frozen. My family enjoys Greek flavors, and this meal can be loaded with veggies that are gobbled down happily with the pasta. For a different veggie combination, mushroom and kale taste great. With this option, I like blue cheese in place of the feta. Broccoli is another favorite in our family. Quinoa or rice could be substituted for the pasta. Use your imagination and let your tastebuds…and whatever you have on hand…be your guide! 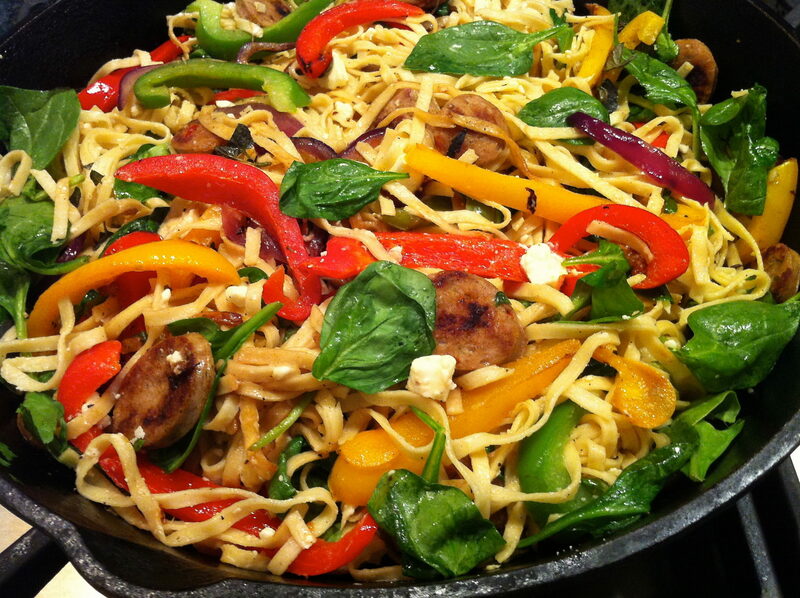 An assortment of peppers lends extra color to this fresh, easy meal. A squeeze of fresh lemon at the end compliments the flavors nicely but this dish is equally delicious without. Feel free to add chopped Kalamata olives to play up the Greek flavors. Cut the sausage into 1/2-inch thick coins and sauté in a large, lightly oiled skillet over medium-high heat until golden brown, 2-3 minutes per side. Remove to plate. Meanwhile, cook pasta according to package directions, drain and toss with about 2 tablespoons olive oil. You don’t need to measure; a light drizzle is fine. Drizzle another tablespoon or so of oil into your skillet and sauté the onions over medium-high heat for 2 minutes or until starting to brown. Add the peppers and sauté another 3 minutes or until cooked but still crisp. Add drained pasta and cooked sausage and toss. Then add feta, spinach, oregano, salt and pepper to taste and optional squeeze of lemon; toss again to incorporate. Cook another 2 minutes or until heated through. Drizzle with another tablespoon or so of olive oil, if desired, and enjoy!